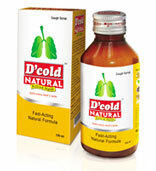 Buy D'Cold Natural Cough Syrup - Provides Immediate Relief From Cough During Cold and From Chest Congestion. D’Cold Natural Cough Syrup is a powerful and unique combination of 11 natural ingredients that give instant relief from cough, cold & sore throat. It is an ayurvedic syrup, fortified with Active Haldi & other 10 natural ingredients is targeted at children and adults D’Cold Natural with Active Haldi has the benefits of turmeric which has been known for centuries for it’s curing properties. Haldi with its anti-bacterial properties provides immediate relief from cough during cold and from chest congestion. The syrup also contains 10 other natural ingredients like Tulsi which acts as an effective expectorant, Sunthi (Ginger) which reduces sneezing and Mulethi which acts as a sore throat reliever. Also D’Cold Natural does not have any ingredients which cause dependence or addiction, which are typically associated with other medicated cough syrups. The product is formulated to suit every child’s taste. Hence it is the best possible natural remedy available for kids. Haridra (Curcuma longa)500.0 mg, Kulanjana (Alpinia galanga)500.0 mg, Shati (Hedychium spicatum) 400.0 mg, Vasa (Adhatoda vascia)300.0 mg, Yasti ( Glycyrrhiza glabra) 200.0 mg, Tulsi (Ocium sanctum)200.0 mg, Pippali (Piper Longum)50.0 mg, Sunithi (Zingiber officinale)30.0 mg, Navsadar ( Ammonium chloride)30.0 mg, Pudinah Ka Phool ( Mentha Viridis)2.0 mg, Madhu (Honey)1.0 mg, Flavoured syrup base Q.S to 5 ml. Methyl Paraben , Propyl Paraben.